Browsing the archives for the Veterans tag. Shinseki is a nonpartisan man, and his choice means that Democrats whose names had also circulated as possible nominees, like former Sen. Max Cleland and Tammy Duckworth, were passed over. That’s a disappointment; who wouldn’t wish Cleland, a liberal favourite, a return to national politics after the way he was smeared in his re-election campaign? But reading the accounts reminding us how Shinseki “warned Donald Rumsfeld that a large force was needed to invade Iraq,” and was dissed by Rumsfeld and Wolfowitz for it, it was easy to feel reassured. Here was a brave man who had spoken up for what was right. Or was he? On the CNN site, Jamie McIntyre takes on what he calls “one of those Washington myths that are almost impossible to dispel”. Critics of the war, he writes, “have lauded Shinseki’s prescience and his willingness to speak truth to power,” but “the facts as we know them are not nearly so complimentary to the retired Army chief”. You see, Shinseki never made any recommendation for more troops for Iraq. [..] According to senior military officers who were in the pre-war meetings, Shinseki never objected to the war plans, and he didn’t press for any changes. Knowing his opinions were not particularly welcome, Shinseki kept his mouth shut. None of this, of course, means he will not be a good V.A. Secretary. It is not disputed that he is a very intelligent and experienced man, with a heart for the military. It also doesn’t mean that Shinseki didn’t, in fact, disagree strongly with Rumsfeld; he probably did. But a man who spoke truth to power, maybe not so much. Which makes his appointment seem in line, in some ways, with those of people like Tim Geithner, Jim Jones and Robert Gates. Exceedingly smart inside players, who seem to have had a keen sense of what was going wrong even as they were themselves to some degree part of it; but who were indeed part of those ventures that went so wrong, whether it was financial deregulation or the Iraq war, and who were cautious, maybe overcautious, in approaching the matter. What Does “Support the Troops” Mean to McCain? 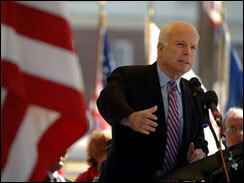 John McCain presents himself as the champion of the military. The truth is the complete opposite. Brandon Friedman over at Huffington Post has collected a list of McCain’s votes for veterans and it’s truly scary. Worse, it reflects a type of military elitism that the press will never recognize, but that those of us who have served see all the time. McCain’s father and grandfather were admirals and he made captain. That’s rarified territory in the US military and far from the high school grads looking to trade in service for the growth in skills and maturity that the military can offer. No where was this more evident than in McCain’s opposition to the new GI Bill.